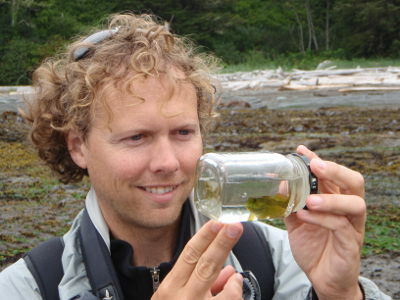 Dr. David Robichaud is a Senior Ecologist and Biometrician whose expertise is in the field of behavioral ecology. His professional career started with LGL Limited in 2001, and has focused on two main areas: telemetry and creel assessment. The telemetry work has focused on the assessment of the survival and behavior of juvenile and adult fishes (salmonids, burbot, sturgeon, lamprey) during migratory movements, often involving passage issues. He has been involved in all stages of this research, including experimental design, study planning, equipment setup and upkeep, fish tagging, data processing, statistical analysis, and reporting. The creel work has included the design and implementation of several large-scale creel surveys, including staff training, data entry, scripting software to automate processing, statistical analyses, and reporting. He has also provided expert advice on creel survey implementation and analysis. Dr. Robichaud has expertise in telemetric and hydro-acoustic surveys of fish behaviour, mark-recapture, video surveys, SCUBA observations, and fish trapping, seining, angling, jigging and trawling. He is proficient at experimental design, and data analysis. He works in R, JMP, Visual Basic, and other more specialized software packages. Dr. Robichaud graduated from Memorial University of Newfoundland with a Ph.D. in Biology in 2001. He holds an M.S. (1996) and B.S. (1994) in Biology from McGill University.